Typing information in form fields is generally one of users’ least favorite parts of online shopping. While we can’t avoid requiring some information from users during the checkout flow, we should seize every opportunity to minimize the amount of typing required. One such opportunity is to auto-detect both “City” and “State” (or “Region”) based on the ZIP / postal code the user has typed. It reduces typing by 40% for a common shipping address. It eliminates typos in the city name and saves users from having to fiddle with long state/region drop-downs. Despite the significant benefits, our checkout benchmarking reveals that 60% of sites do not auto-detect city and state based on the user’s typed ZIP code. Furthermore, our testing reveals that for sites that do auto-detect, there are 4 UX implementation details to be mindful of. Note: for simplicity we’ll use the terminology “ZIP” and “State” throughout this article – the solution however applies equally to most other western countries that use “Postal Code” and “Region.” At the end of the article we’ll also address the internationalization aspect. 5 fields: Name, Address Line 1, City, State, ZIP, vs.
“It just could have had the same as the other one, where it figured it out itself – that would have been fantastic. It’s fantastic when it can figure it out itself, so you don’t have to type everything. That’s really annoying.” As users are delighted by auto-detection at other websites, their general expectations will steadily rise to a point where they will be disappointed when a site lacks the feature. Besides speeding up the completion of the form, auto-detection also has the potential to bring delight to users in an otherwise dull typing process. When first running usability tests of ZIP code auto-detection in 2009, it was purely observed to be a “delight” parameter for users – but over the years, as users more frequently encounter such features on e-commerce sites in general, their general expectations have increased. Following the Kano model, what delights users today will be seen as a “standard” feature in the near future, and at some point even disappoint users when absent – a general UX degradation phenomenon explained further in our article UX and the “Kano Model”. Anytime users have to type information, typos will eventually occur. 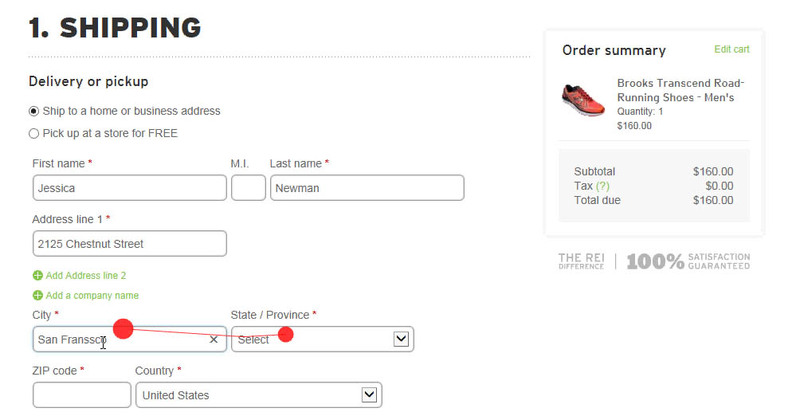 “City” inputs can be especially prone to misspellings, as frequently observed during our checkout testing. While the city and state input values aren’t complex to understand in themselves, typing and selecting them still can be relatively time consuming – in particular long drop-downs are consistently observed to cause needless fiddling. In fact, during our latest study on checkout usability, 30% of the test subjects, across all tested sites, experienced issues that could have been avoided with a ZIP code auto-detection, e.g. 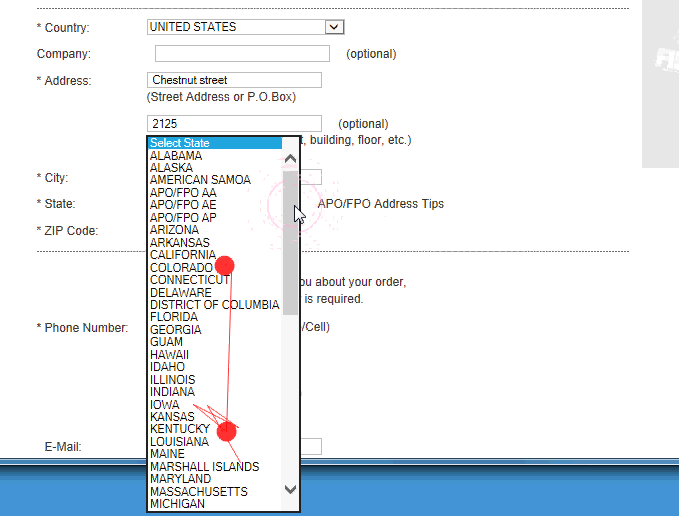 difficulty locating the state in the drop-down or typos in the city name input. However, one word of caution: having city and state fields expand above the ZIP field, to simulate a normal address sequence, is ill-advised. We generally observe that users have severe issues noticing when new fields are added above the trigger area (in this case the ZIP code field), as it breaks the downwards-focused reading and typing flow used in all western countries. 2: Can “City” and “State” Fields be Hidden Entirely? The two primary designs for ZIP-based auto-detection. In this first type of design “City” and “State” are visible and pre-filled once the user enters their Zip Code. 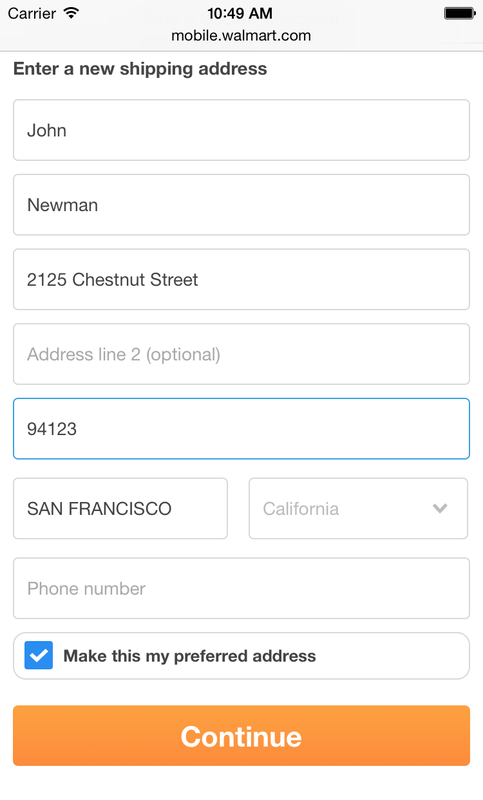 In the other type of design, the two fields are hidden and there’s a small text snippet implying that the values will become available once a ZIP Code has been provided. The test sessions did not provide any definitive answers on whether it is best to hide or display the city and state fields by default. The safe choice is to permanently display city and state fields since users will expect these fields to be present in an address form. Hence, in this design, the auto-detection simply pre-fills the existing state and city fields, once the ZIP code has been entered. 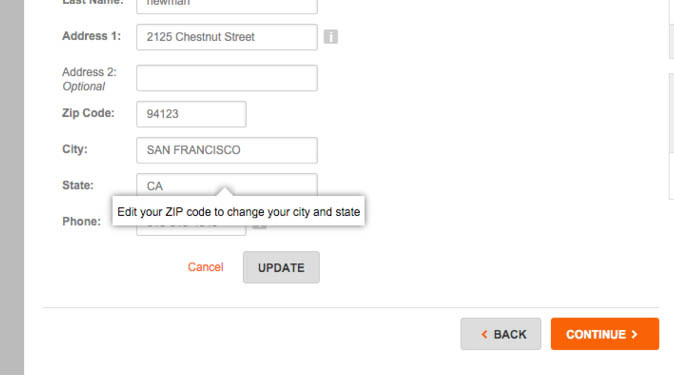 While Home Depot auto-detects city and state based on ZIP code, there’s no fallback to allow users to edit the auto-detected values. A 100% abandonment rate can be expected for any users where the address doesn’t match the city and state database the site is using. While auto-detection of city and state will initially help the vast majority of users, it isn’t flawless and will occasionally fail, either due to technical issues, or because the database isn’t 100% updated at any given point in time – something that must be expected for short duration, such as when a new city names is added or updated, ZIP codes are expanded, etc. Even though this will only be an issue for a small number of users, these can however be expected to have a near 100% abandonment rate if there’s no fallback option, since they are otherwise forced to submit an incorrect address. A fallback for the auto-detected city and state values is therefore always needed, allowing users to manually override the auto-detected values. In fact, when conducting a checkout audit for a mid-sized e-commerce client, we witnessed the lack of a fallback solution to be the sole cause for a negative A/B split-testing outcome of auto-detection versus no auto-detection. While we’ve found a fallback to be critical, we have not observed any performance differences in how the fallback is implemented (drop-down, open text fields, edit link, etc.). 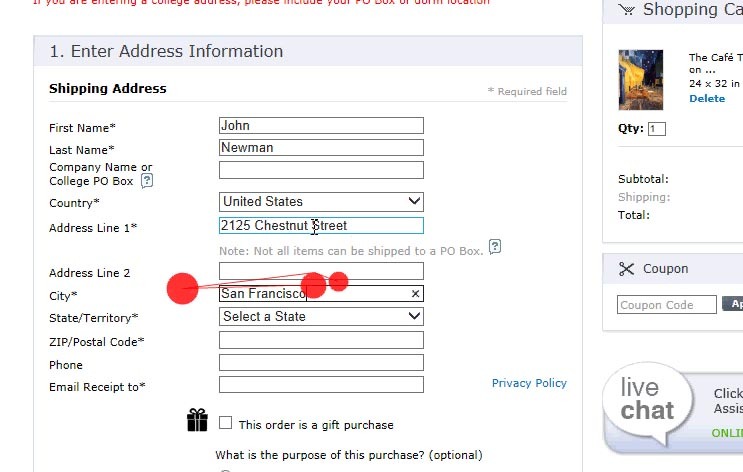 As soon as test subjects typed the 5th digit in the ZIP code field (first image), Walmart’s auto-detection kicked in and provided the matching city and state name (second image). During our eye-tracking tests of checkout flows, we observed that users expect to get immediate feedback when typing information into form fields. Users generally do not click out of a form field just to see if anything happens, and mainly click to the next field when they shift their focus towards that next input. This user behavior clashes with sites where the city and state auto-detection features require that users leave the field before any change is registered. On such sites we observe that a sub-group of users will start to doubt why nothing happens, while others even overlook that there’s auto-detection available, and some think they have to save or apply their information, etc. At the very least, auto-detection that only kicks in when users leave the field, will frequently cause an interruption if users have progressed and started to interact with the next field in the form – only to then be interrupted by auto-updating information suddenly appearing. Put more directly, the auto-detection should not just kick in when the ZIP code field loses focus – i.e., don’t just rely on an onblur event. Instead, the auto-detection should kick in the moment the user has typed enough characters to make a meaningful detection. For instance, for a US ZIP code the auto-detection should kick in as soon as users have typed their 5th digit. During our past 7 years of checkout usability testing we’ve observed ZIP-based auto-detection of the user’s city and state to speed up form completion times, eliminate numerous misspellings and typos, and generally cause user delight. Clearly, this represents a great opportunity to improve the user experience – yet sadly, a staggering 60% of the largest US e-commerce sites still fail to take advantage of it. When testing mobile e-commerce sites the auto-detection of city and state proved to influence checkout UX performance even more than on desktop. This example shows Walmart’s mobile site – notice how users still have the option to override the auto-detection. Furthermore, during our usability test studies of mobile e-commerce sites, the UX benefits of auto-detection proved even more important than for desktop checkout flows. Mainly as typing out the city name and selecting a state in a massive drop-down is much more taxing and error-prone on the small mobile screen than it is in a desktop checkout context. Users must always be provided with a fallback option to override the auto-detected values (as the auto-detection will occasionally inaccurate). Auto-detection should kick in immediately after users have entered the last digit in their ZIP or postal code (and not just when they leave the ZIP code field). The “City” and “State” fields should be shown (or injected) below the “ZIP Code” field – even though it’s an unconventional address sequence. In terms of implementation, the two most common approaches to auto-detection are either using a 3rd-party vendor, or acquiring a postal database for your key markets and then setting up the detection logic yourself. The latter option means less external dependency but will typically require a larger initial investment and more ongoing maintenance. Regardless of which route you go, it is strongly recommended to treat this as a progressive enhancement so that JS bugs, ZIP-code database downtime, etc., don’t result in a broken checkout. For sites that sell to more than one country, supporting auto-detection for cities and regions based on the user’s postal code can be complex, and for sites that sell internationally it is often unrealistic to support every single country shipped to. Indeed in some countries postal code are infrequently used, hence all users don’t even commonly know their own ZIP code – e.g. China and select Eastern European countries. Auto-detection should instead be seen as an enhancement of the typing experience that can be applied for the site’s key markets – where it is justifiable to spend the necessary resources required for a robust implementation and ongoing maintenance. Authored by Christian Holst. Published on December 12, 2016. I think the accuracy of ZIP to City/State matching is overstated in this article. 42% of U.S. ZIP codes map to more than one city. While that number may be much lower if you have a primary city/state for each ZIP that the majority of people in a ZIP match to, it’s still a concern. A third-party service that looks up street address and ZIP might also improve accuracy significantly. But I’m not sure that exists and it has the concern of relying on a third party service for availability/speed. While I see the obvious benefits of reducing typing and UI element interaction for the user, I wonder if the % of incorrect auto-detection events hurts conversion rates more than this article lets on. Is there A/B testing referenced that I missed showing that auto-detection improves conversion rates? Hi Eric, good concerns. As David points out some sites use a city drop-down to display multiple matches. The way most sites deal with these city drop-downs (for presenting multiple values) and at the same time account for a safe fallback is always having an “Other” option in the drop-down which turns it into a open text form field. I’ve updated the article with an example of this from Apple – you can see it under section “3: Always Have a Fallback for Auto-Detection”. For your question on incorrect matches hurting conversions we do not observe this to be the case during testing – as long as a fallback is always available so users can override the auto-detection. For specific A/B testing: we can’t share client-data, “only” our large-scale usability test findings (those presented in this article). I would worry in that scenario about an outdated database/service presenting the wrong options. With a straight dropdown there is no recourse for the user to correct and they will drop off if the options are incorrect. The safest tact seems to be pre-filling the “primary” city/state combo, but allowing the user to edit as necessary. but what about a website that has an audience whose ZIP codes vary from 5 to 6 digits, not all 5 ! there will be too much frustration. Have you tried anything to test this assumption Mahmoud? Does zip-code auto-detection work for non-U.S. countries? Hi Kerry, yes in most countries the postal code contains enough information to automatically set the “City” name and the “State” / “Region” input. From a resource perspective, I’d recommend you consider only supporting this in your key markets, so you can ensure a good integration here.